After armed Syrians were spotted near the border, IDF soldiers evacuated tourists from the area. Armed Syrians were spotted near Israel's northern border on Wednesday, prompting IDF soldiers to quickly evacuate tourists from the area. The armed Syrians were spotted on the Syrian side of the border, in the area of Mount Hermon. Israeli military personnel rapidly deployed to evacuate all visitors from the scene, and from nearby tourist locations. Channel 2 reported that the IDF later ascertained that the Syrians had not been headed toward Israel, and that calm has been restored to the area. The northern region has been an issue of increasing concern for Israel, given the escalating chaos resulting from the savage civil war taking place on the other side of the border. New security fencing and trenches are being prepared along the border, and early-warning alert systems are being installed along with reconnaissance equipment in preparation for any possible scenario, Israeli military sources said. The equipment, which is being installed by the Combat Engineering Corps, “is responsible for fortification and preparations that must precede a war” but does not necessarily mean that a conflict is imminent, sources said. Several mortar shells landed in Israel less than two weeks ago, fired by Syrian Army regulars at opposition forces holed up nearby. The shells exploded in an area near Kibbutz El Rom on the Golan Heights. Israeli Ambassador to the United Nations Ron Prosor filed a formal complaint with U.N. Secretary-General Ban Ki-moon over the incident. 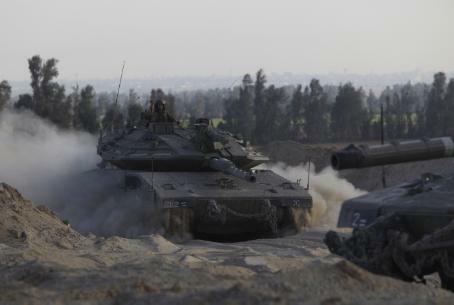 Also last month, the army staged a surprise one-day military drill on Israel's northern border. The exercise, which was previously scheduled, ended with a live-fire drill under the watchful gaze of IDF Chief of Staff Benny Gantz and other top officials.